Having recently settled a work dispute with Harry Shearer, voice of multiple major characters on The Simpsons, it seems like the show is going to get the most possible use out of him they can in Season 27. Shearer voices both Waylon Smithers and C. Montgomery Burns, renowned for Smithers’ unrequited love for his 100-something-year-old boss. Springfield knows Smithers’ orientation, but Burns barely knows how to use a telephone, so he’s been the last to catch on. That’s going to change. 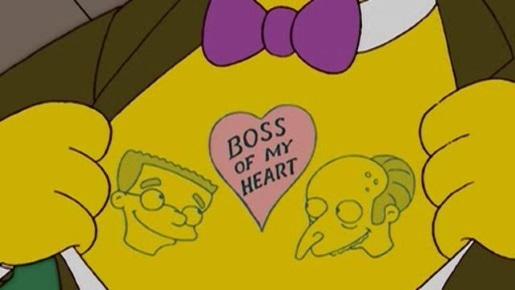 Smithers is going to come out as gay to Mr. Burns this season. Given that the show has had active gay characters since, well, for a long time whenever Marge’s sister came out as a lesbian and adopted a Chinese daughter, this seems like a strange thing to talk about. After all, everyone else in Springfield knows about Smithers, but maybe the show is going to do something interesting with the reveal regarding the Burns and Smithers relationship or lack thereof. Hopefully they won’t turn Burns, considering his romantic history.